A 3-week investigative process that uses futuristic narratives to explore solutions to contemporary concerns around race, gender, identity, technology, spirituality and globalization. 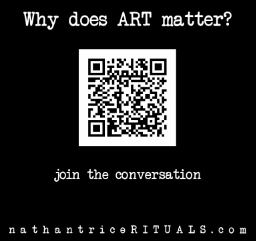 nathantrice/RITUALS project-by-project dance theater is a Sponsored Artist with Performance Zone Inc (dba The Field), a not-for-profit, tax-exempt, 501(c)(3) organization serving the performing arts community. Thank you for your generous support.